You must make reservations at least 5 minutes in advance of the time at SER Steak+Spirits. Complimentary valet or self parking available. With the city’s skyline as the backdrop, the five private event rooms on the twenty-seventh floor of the Hilton Anatole’s Tower make a powerful statement. Dining in the Bear & Driver Boardroom affords extra touches of style and grace. We offer accommodations to groups of all sizes. With 4 Private Dining Rooms, our Executive Boardroom, the "Bear and Driver", and customized menu offerings, we'll ensure your group is taken care of! The Chef's Table seats 10-12 people; The Bear & Driver Boardroom seats 10-16 people. 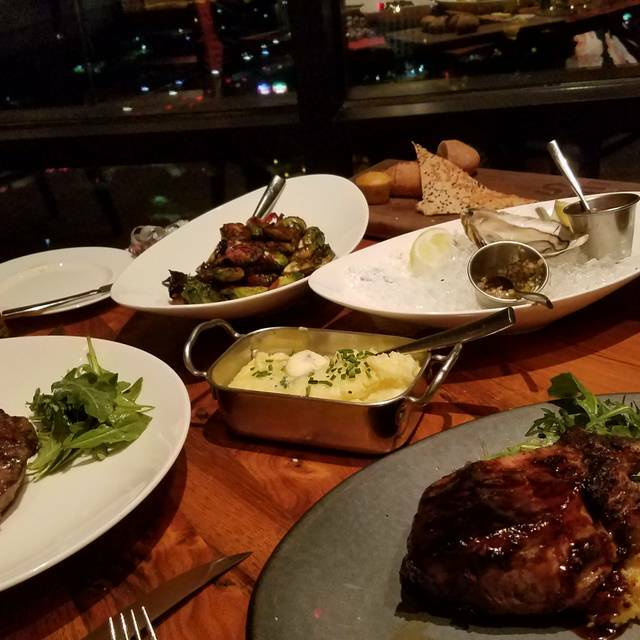 SĒR Steak+Spirits offers upscale steakhouse cuisine with a spectacular view of the Dallas skyline from the 27th floor. The restaurants open, airy layout is both casual and sophisticated. Warm cognac and whiskey leathers, locally sourced end-grain mesquite walls and community tables, rich mesquite floors and solid walnut table tops create a masculine, yet hip and urban feel. A chef's table and wine display are an intimate destination adjacent to the exhibition kitchen. 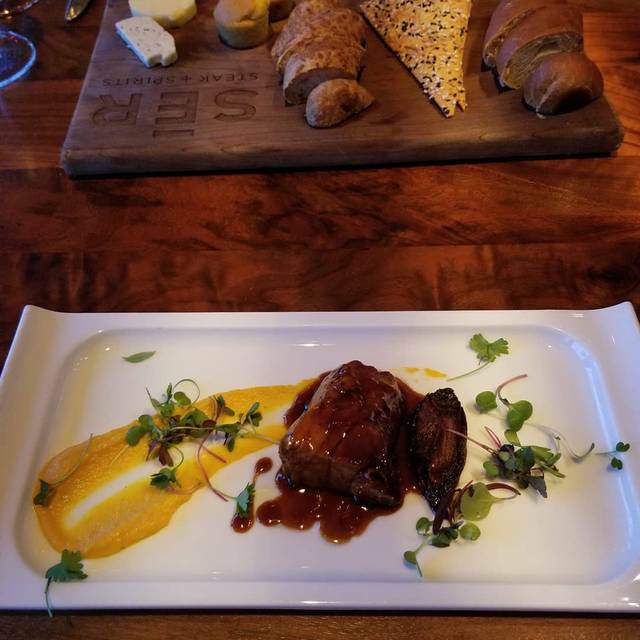 SĒR Steak+Spirits offers prime cuts of the finest beef, the freshest of seafood, and unique appetizers and side dishes, along with a Best of Award of Excellence award winning wine program that clearly differentiate it as a new style Dallas steakhouse. 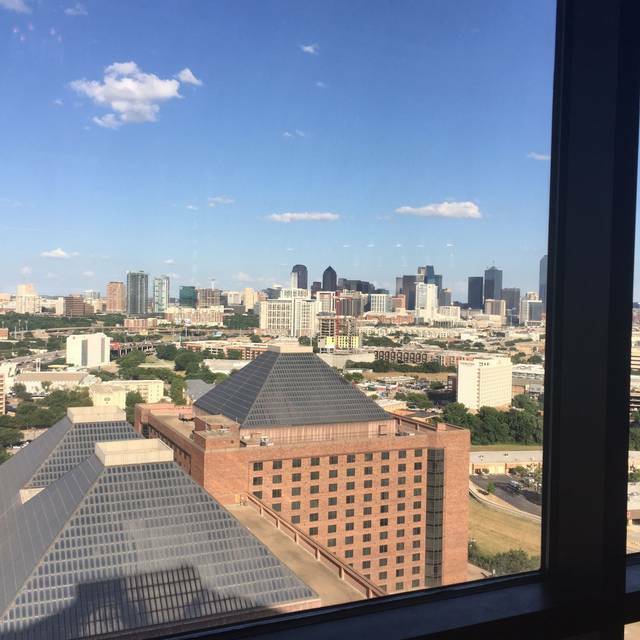 SĒR's picturesque 27th floor perch atop the Hilton Anatole Hotel has become the destination of choice for special celebrations, social events, and business dinners...not to mention the favorite of locals. *Window seating based on availability. We had great expectations but were disappointed. Over priced for quality of food and service. Gorgeous venue with delicious food and wine. A super evening, thank you! Visiting Dallas for work event. Had a great time at Ser. Excellent view, food, service! This restaurant caught me completely off guard. I never suspected that a restaurant of this caliber existed in Dallas. Everything was as perfect as it could possibly be. I will be back and will tell all of my foodie friends. And, one more thing, the Elk done medium rare was the best steak that I have had in my life. At age 68, that’s saying a lot. Highly recommend! Service was very attentive while paced perfectly. Everyone’s food was served hot and delicious, cooked to perfection. Piano playing in the background was beautiful and exactly the right noise level. And of course the view was spectacular! The food here was great and the service couldnt have been any better. Our server was Javier, he was very informative and did a great job making us feel comfortable in a new restaurant. The view was great, got there right before dark so got to see the skyline come on. The food was delicious, wasn't near as expensive as I thought it would be, but I was definitely satisfied with the taste and price. Only thing I have to say is if you're looking for a quiet dinner this may not be the place. The band was on the other side of the room but it was still there. The crowd wasnt bad but everyone was enjoying their evening. Overall a great romantic dinner. loved our waiter Frank! Very kind and knowledgeable about the different food on the menu. Excellent customer service. We had a great view of the city! The food and service was very good. We celebrated my son’s 30th. He loved it! It was very loud! So this may not be a quiet date kinda place. However it’s a wonderful place to dine. We had a wonderful dining experience!! Absolutely phenomenal host and met every need, want, and question. Extremely professional and personable. Made the experience from great to stellar. Thank you! 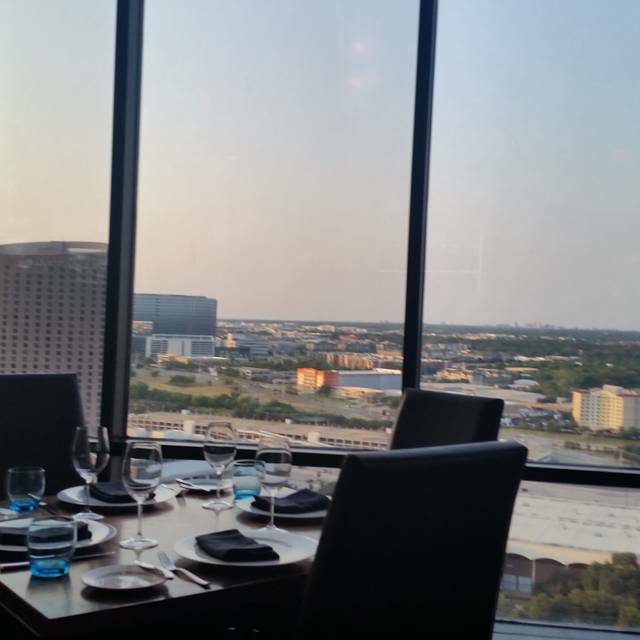 SER is a beautiful restaurant with one of the best views in Dallas. They seated us for our 6:30 pm reservation by the window overlooking downtown Dallas. It was perfect. The service was outstanding! We shared a shrimp cocktail which I thought was just OK, and then each had a steak. 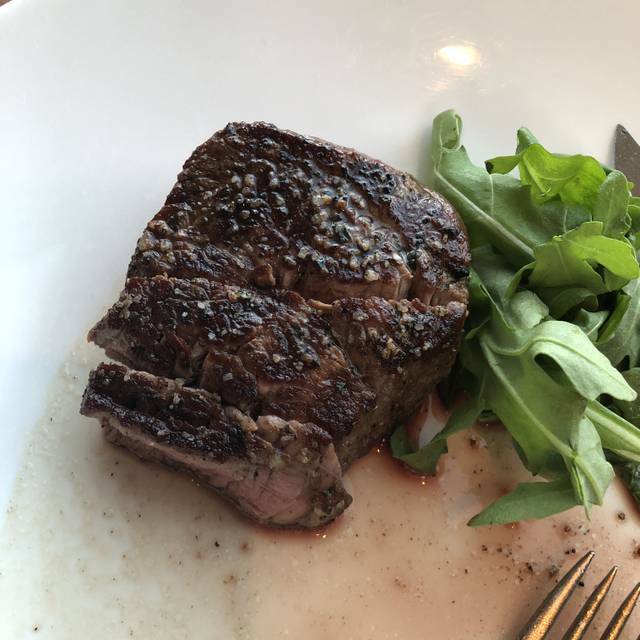 My filet was fabulous but I think my date's steak was a little fatty for his taste. Overall it was a beautiful romantic experience which is just what we were looking for. The food was delicious and the service was excellent. We had a great view of the city. We are going back again tonight! The view is amazing and the food was spectacular. I loved the mini jalepeno cornbread muffins. The candied bacon was incredible. After every bite I wanted to walk back into the kitchen and give the chef my compliments. We had oysters, ribeye, poutine, iceberg salad, asparagus, and lobster bisque...oh the lobster bisque! 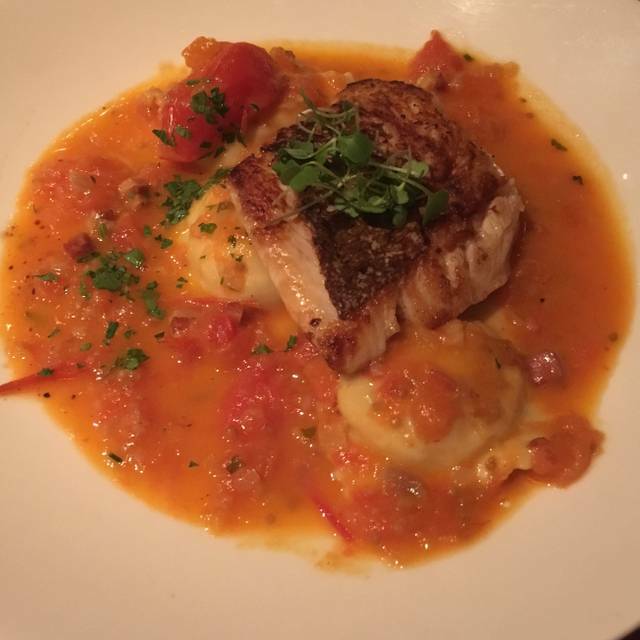 The service could have been slightly better, but the food more than made up for it. 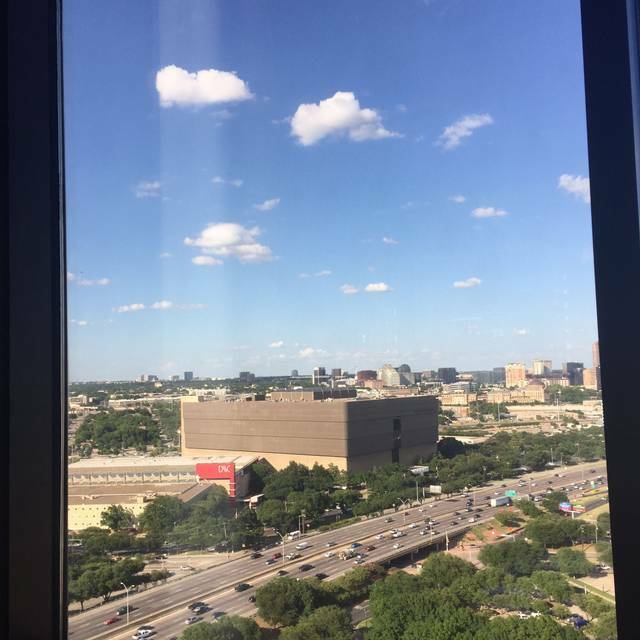 I was staying at the Anatole on a business trip ; not your pedestrian hotel restaurant...a special treat....comfortable room with great view of the city; really interesting menu for a "steak place"....lots of good choices...the rack of lamb was perfectly cooked and perfectly seasoned. 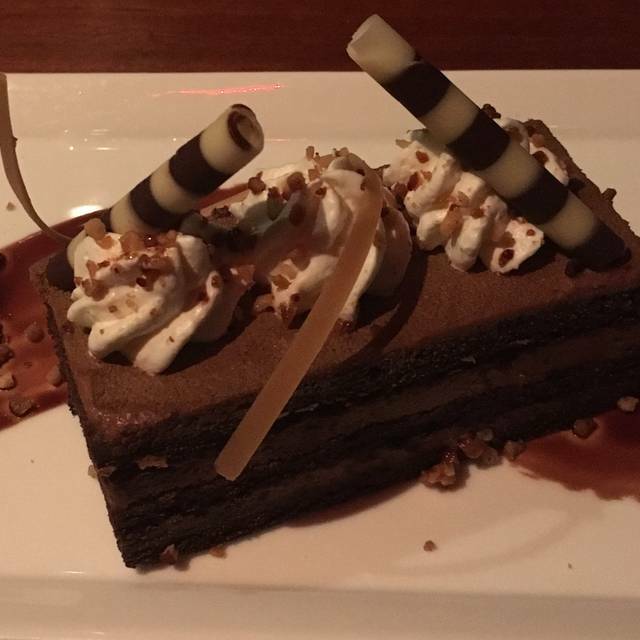 The chocolate "elvis" dessert was amazing. Great place to eat. Loved the Foraged Mushrooms. Steak was cooked just the way I like it. Slightly over salted, however. This is our third year dining at Ser for our anniversary and we enjoyed it as usual. We had a different waiter this year who was very professional and accommodating, but just not as bubbly as our waiter from the first two visits. Our current waiter was very attentive, taking notice I was cold before the meal started and graciously offered to move us to another table. Take a jacket if you are next to the window because you are under the vent. Overall, loved the food and ambiance, definitely worth the cost! We will return again next year. AMAZING! Excellent dinner; great meat cuts and desserts! Our romantic Valentine celebration turned into bonding over the laughably bad dining experience. Service was rushed and impersonal, steaks were overcooked, then a server dropped a utensil that shattered a glass, shards of which fell on to my plate. Management came over to apologize and replace the steak, at which point I pointed out it was overcooked. New steak came out cooked even more than the first. They were relatively tough, dry, and flavorless, no charring on the outside, cooked medium (ordered medium rare), unimpressive presentation, and the lobster tail atop was rubbery and not shelled - very difficult to remove. The Brussels sprouts and crab cakes were very good and the tres leches cake was okay. The bottle of wine we had was fantastic but there was no help selecting it and the timing/presentation was awkward and inconvenient. We also had to pour our own refills past the first glass. Management was apologetic and extremely kind (comped an extra round of port with dessert) - I wonder if our waiter was having a bad day or just didn’t like us for some reason (unacceptable for a place like this). The restaurant and view were beautiful. Valet was nice but very busy. If the steaks had been better we might give it a second chance, but overall disappointed enough to not return. Frankie was amazing and made great recommendations! A must visit! Phenomenal culinary combinations with elite service. Incredible views with the ambiance for great dates or any kind of meeting! Our server was wonderful. We really really liked her. Valentines Night out♥️ from the moment we walked up to the time of departure service was 5 ⭐️. Javier provided excellent service and recommendations. The steaks were amazing. I can’t wait for the next time! Dinner was spectacular! The flavors of the pomme purees and charred tomatoes blended and complimented each other and the steaks very well, the steaks were cooked as requested with just a touch of searing on the outside yet melt-in-your-mouth tender on the inside to be complimented with a great bottle of wine, breads and cheeses. 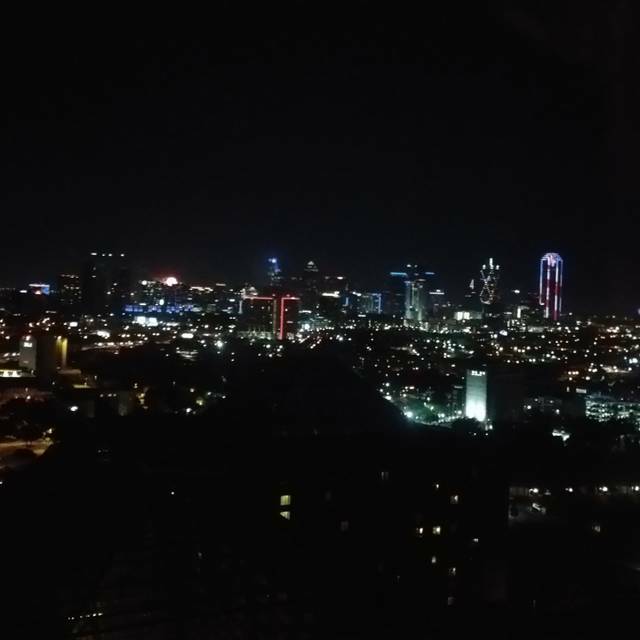 The service was equally impressive; quietly observant, standing by ready to assist in any way to better our dining experience and the views can’t be beat at the 27th floor height overlooking Dallas and the sparkling lights as darkness settled in over the city. Made for a very appreciated dining experience. A great experience and our waiter was AWESOME. May have been the best experience I have had eating out in a long long time. We really enjoyed it. Thank you. The ambiance is perfect at SĒR it might be the best ambiance in Dallas but the food is horrible, steak was so chewy and they give you 2 asparagus with 3 scoops of potatoes. We went for valentine’s day and the food is overpriced, you are really paying for the view. Drinks and desserts were great and the service is on point.